This location provides business with serviced offices that are both spacious and affordable. This offices are perfect for any size company looking to grow. This location offers inclusive pricing plans, separating itself from the competition. This serviced office space strives to provide companies with all of the amenities needed for success. Located near many local transportation stations for convenience. Newly built, modern business center in Gaithersburg-Rockville area off I-270 and within walking distance of Rio Washingtonian Center. Fully furnished executive suites with excellent business support services and amenities such as cafe, covered parking and fitness center. 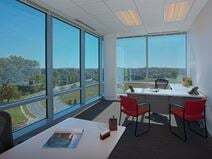 Impress your clients by taking flexible office space in this sleek, modern office building situated in south Gaithersburg, a peaceful area away from the hustle and bustle of the city center. Fully equipped six person team spaces, 10 person meeting rooms and a business lounge. There are also great transport links, perfect for commuting such as Shady Grove Metro station which is only a few minutes walk away and easy access to the I-270 for Washington D.C.